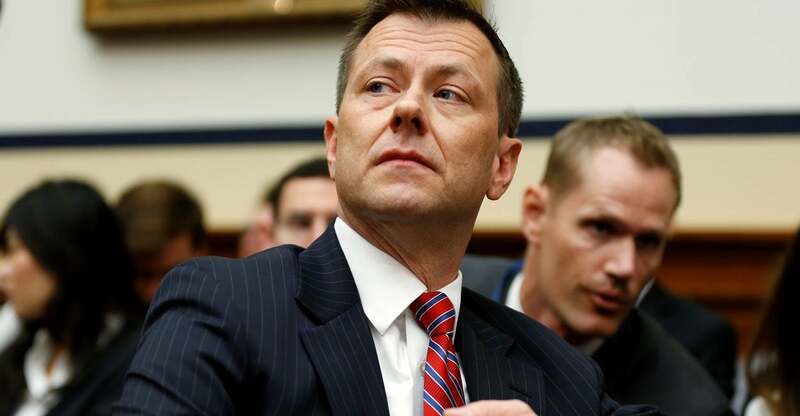 Department of Justice investigators were unable to recover text messages Peter Strzok and Lisa Page sent during their short tenure on the special counsel’s investigation, according to a report released Thursday by the DOJ’s Office of the Inspector General. According to the inspector general report, iPhones issued by the Special Counsel’s Office to Strzok and Page were reset after they left the special counsel probe in July 2017, making it impossible to retrieve text messages sent and received on those devices. There is no allegation of wrongdoing on the part of Strzok and Page in the report, which was issued by Inspector General Michael Horowitz. But the absence of text messages from a crucial period of time prevents Congress and the public from seeing whether Strzok and Page’s anti-Trump sentiments carried over into the special counsel’s probe. Strzok and Page exchanged tens of thousands of text messages in the months before joining the Special Counsel’s Office. Exchanges retrieved from their FBI-issued devices showed a deep animus toward President Donald Trump. Some of the exchanges even suggested Strzok and Page, who were having an affair, actively sought to prevent Trump from becoming president. Just days after he opened the FBI’s investigation of the Trump campaign, Strzok told Page “we’ll stop” Trump from becoming president on Aug. 8, 2016. Strzok joined special counsel Robert Mueller’s team in early June 2017 and was removed in late July of that year after Horowitz informed the special counsel about the FBI officials’ anti-Trump messages. Page, who served as general counsel to then-FBI Deputy Director Andrew McCabe, was detailed to Mueller’s investigation May 28, 2017. She left July 15, 2017, and since resigned from the bureau. The new report from the Office of the Inspector General focuses mostly on a five-month gap in messages between Strzok and Page. When investigators began looking at Strzok and Page’s FBI-issued phones, they found no messages from Dec. 13, 2016, to May 17, 2017, the same day Mueller was appointed special counsel. The FBI chalked the missing text messages up to a glitch that affected the message retention system on many FBI-issued phones. Government forensic analysts were able to recover many texts from the missing period. The Office of the Inspector General did not dispute the FBI’s claims about why the messages were missing from the phones. The phone Strzok used while he was on the Mueller team was inspected by a records officer with the special counsel, who found no “substantive” messages on the device. Page’s device was only recovered by the inspector general in September. It had been reset to factory settings July 31, 2017.